Acknowledged author Geltner/Miller/Clayton/Eichholtz wrote PKG COMMERCIAL REAL ESTATE ANALYSIS & INVESTMENTS W/CD comprising 864 pages back in 2013. Textbook and etextbook are published under ISBN 1133108822 and 9781133108825. Since then PKG COMMERCIAL REAL ESTATE ANALYSIS & INVESTMENTS W/CD textbook received total rating of 4 stars and was available to sell back to BooksRun online for the top buyback price of $76.68 or rent at the marketplace. Rev. ed. 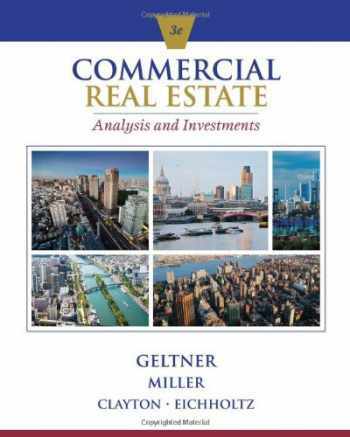 of: Commercial real estate analysis and investments / David M. Geltner ... [et al.]. Mason, Ohio: Thompson South-Western, c2007.